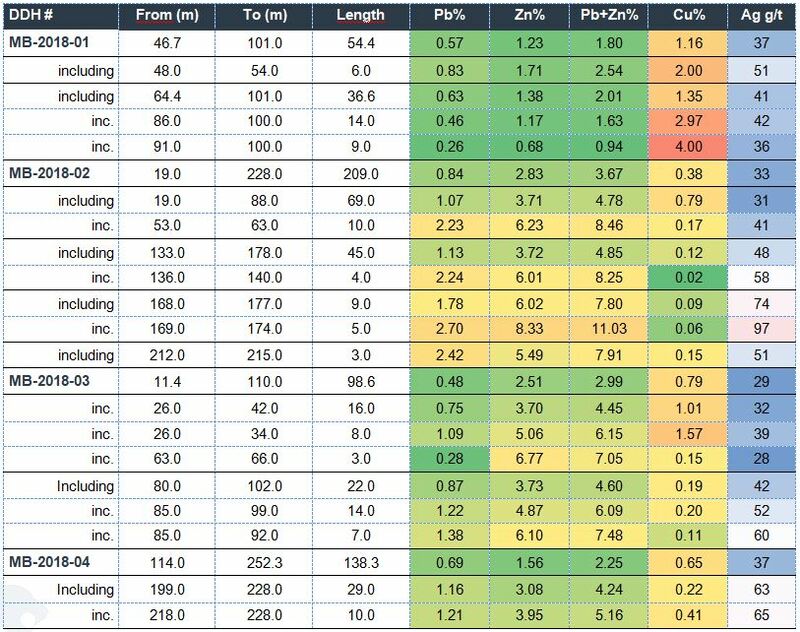 Puma Exploration Inc. [PUMA-TSXV] and Trevali Mining Corporation [TV-TSX] are pleased to release the drill results for the metallurgical drilling program conducted at the Murray Brook Deposit. 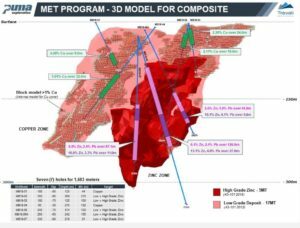 The program successfully intersected the Massive Sulphide Deposit in each hole matching perfectly with the Resources Model and a potential internal mine design. The metallurgical program consisted of 1,683 meters of drilling within seven (7) new holes collared on the Deposit. The locations, orientations and angles of the holes were defined according to a preliminarily mine design. The main targeted zones of the Deposit were the High-Grade Zinc Zone, the Low-Grade Zinc Zone and the High-Grade Copper Zone. 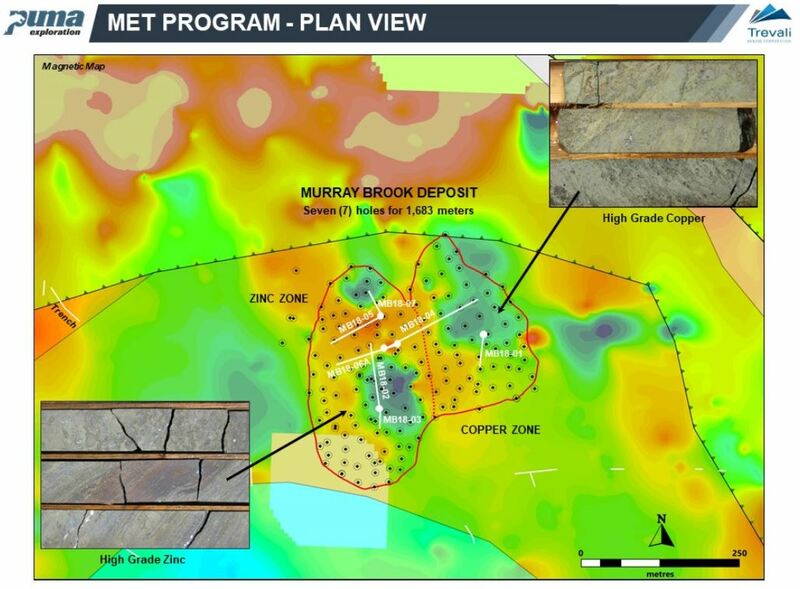 The priority was to proceed with the High-Grade and Low-Grade Zinc Zones recovery tests and then evaluate any potential future benefit within the High-Grade Copper Zone, the Oxyde Zone and the Gold recovery of the Deposit. The recovery tests are currently in process at RPC Facility in Fredericton, New Brunswick. a. MB18-05: 6.1% Zn, 2.1% Pb (8.3% Zn+Pb) over 120.9 meters; including 13.1% Zn, 4.8% Pb (17.9% Zn+Pb) over 27 meters. b. MB18-06A: 3.8% Zn, 1.2% Pb (5.0% Zn+Pb) over 158.1 meters;including 7.6% Zn, 2.8% Pb (10.4% Zn+Pb) over 24 meters. c. MB18-07: 6.9% Zn, 2.4% Pb (9.3% Zn+Pb) over 87.1 meters;including 10.2% Zn, 3.1% Pb (13.3% Zn+Pb) over 21 meters. 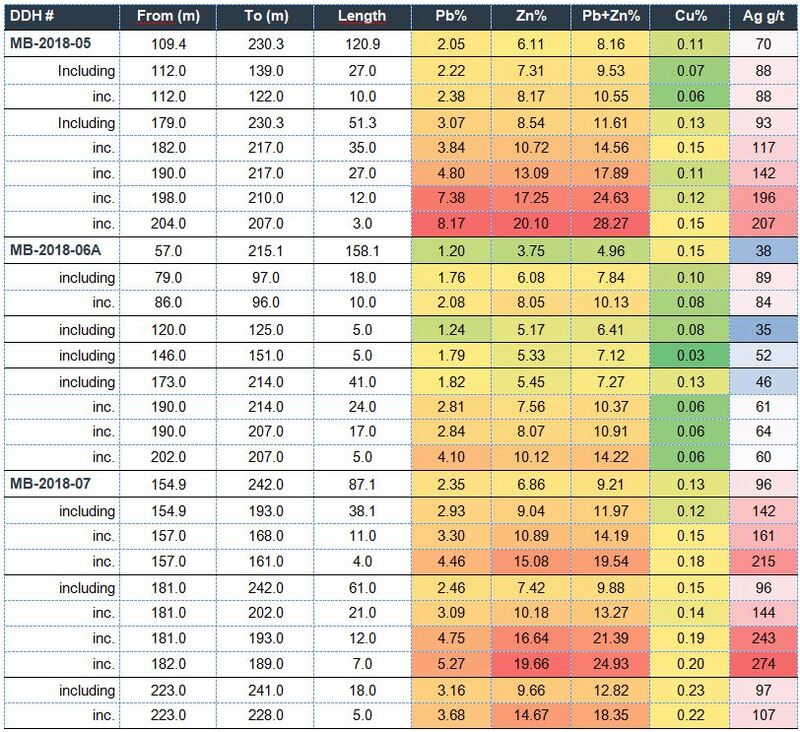 g. MB18-04: 0.85% Cu over 75.0 meters including; 1.0% Cu over 32 meters. “We are very happy with the initial drill results of the metallurgical drilling program. 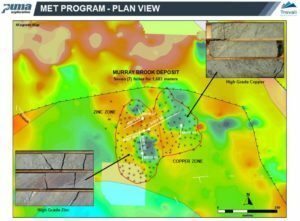 Those results represent well the continuity and the high-grade core of the Massive Sulphide Deposit which brings different potential mining scenarios at Murray Brook”, notes Marcel Robillard, President of Puma Exploration. The technical team is currently logging and sampling the drill holes of the geotechnical and exploration drill programs and are supervising the execution of Borehole geophysical surveys. The survey is aimed at localising new mineralised zones in proximity of the recent drill holes and characterizing the mineralization intersected in the holes. Note: the true thickness is ranging from 70%-90% of the core intercepts. The samples are shipped, stored and assayed at the laboratory of the Caribou Mine site held by Trevali Mining Corporation. Trevali has an option to acquire 75% interest in the Murray Brook Deposit from where the drilling program was conducted. The samples are crushed and pulverized at a range of 80 to 100 microns. The crusher and pulverizer are cleaned with pressurized air between each sample. The samples are assayed by Absorption Atomic for Zinc (Zn), Lead (Pb), Copper (Cu), Silver (Ag) and Iron (Fe) content. For QA/QC, there are typically 8 standards runs for each batch of 25. A duplicate is done at least once every 50 samples, no blanks are run. Pulps are currently stored in the lab in labelled brown sealed bags which in turn are stored in organized labelled boxes. Coarse rejects are stored in labelled 18L pails on pallets inside the Alliance warehouse. The core of the mineral resource occurs in the West Zone (Zinc-Lead) which is 200 meters wide, extending from surface to 300 meters vertical and the true thickness of the Massive Sulphide body varies from 75 meters to 100 meters. The East Zone (Copper-Gold) is 100 meters wide, also extending from surface to 300 vertical meters and is mainly mineralized with Gold and Copper. On February 20th, 2017, a NI 43-101 report was filed on SEDAR. Trevali’s Caribou mine is located approximately 10 kilometers east of the Murray Brook Deposit. It comprises an underground mine, a 3.000-tonne-per-day (tpd) processing mill, a flotation recovery plant, metallurgical and geochemical laboratories, as well as a tailings management facility. Puma Exploration is a Canadian mineral exploration company with advanced precious and base metals projects in Canada. The Company’s major assets consist of an option to acquire 100% beneficial interest in the Murray Brook Property, the Turgeon Zinc-Copper Project and the Nicholas-Denys Project, all located in New Brunswick. Also, Puma owns an equity interest in BWR Resources, Manitoba. Puma’s objective is to focus its exploration efforts in New Brunswick.